This is a wall of naruto and the yondaime, the image of was vector by me, everything in this wall is vectored, this took 2 days, since i couldn't find what else to add, there are a few grunge texture behind the background, and there's the sun, i did the sun backgroud with the pen tool like my anko wall, then the clouds too, and then put alittle texture in the sun and then some other then i added a shadow of naruto and the yondaime, hmm thats all i think, hope you like it, ja! CUTE! but i think abit more shadowing would be nice...and the windows don't look 3-D enough... or...is that meant to be?! Nice work! Thanks for sharing another great wallpaper! waiii! you made a wallpaper! *glomp* too cute! this is so cute! one of my fav fanart of yondaime and naruto! they just like father n son ne! i love it! Naruto's so cute. great wall~! :O Father, Son moments always are special! 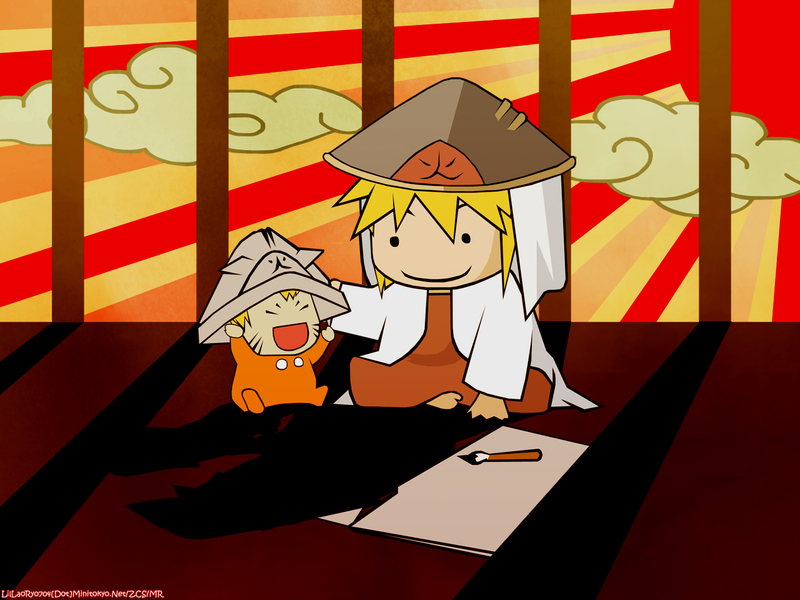 hahaha... cute chibis of the Yondaime and naruto! the backdrop also looks nice...something that's from a children's comic book! so cute and adorable... a bit plain... but i love the idea... thanks for sharing! Cute wallpaper of Naruto and Yondaime.